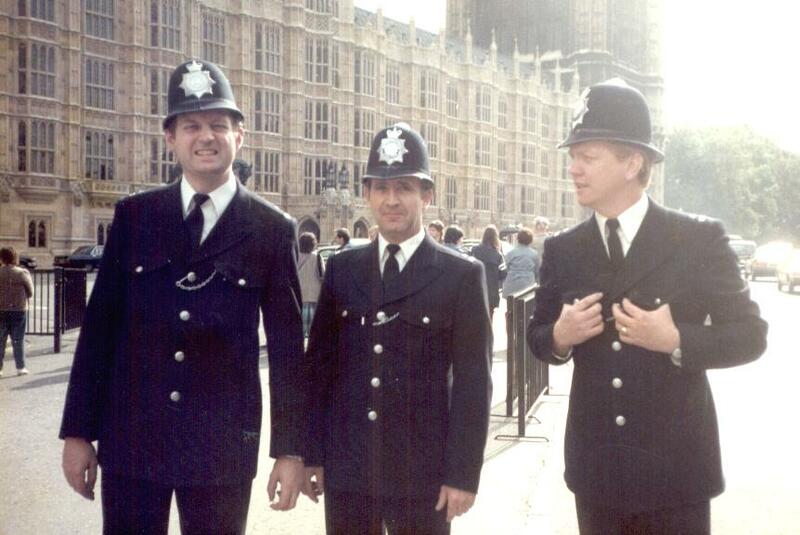 If you have any memories, stories, photographs you would like to share about your time at The Palace of Westminster, these are YOUR pages. IF PICTURES ARE SLOW TO DOWNLOAD TRY HITTING 'REFRESH'. DOWNLOAD TIP FOR NEW VISITORS: BE PATIENT AND LET THE WHOLE PAGE DOWNLOAD. THEY WILL THEN BE 'CACHED' IN YOUR PC. ON SUBSEQUENT VISITS THEY SHOULD DOWNLOAD MORE QUICKLY.. If this picture brings memories flooding back send your thoughts via 'MAKE CONTACT'. Just click on the link at the top of the page. L-R: PC's Mick BURGESS/Tim HODGES/Chris STIEL/Roy NORWOOD/Shel TIBBLES/'Jock' BOYLE/Andy GRANT/Chas HUNT/PS. Bill CROSS/???? HUTCHINGS/'Russ' CONWAY/Mick PLUNKET/Chas LYDFORD/Jim OSBORNE/John HOLLEY. Was awarded the Distinguished Service Medal for firing the Hedgehog, a depth charge firing device, which was both a danger to the ship and the man firing it. The Skipper Lt. Comdr. SCOTT of the Royal Navy Frigate HMS 'Nyasaland' had positioned his vessel above a U Boat in the bay of Biscay, and had ordered all water tight doors to be sealed as is normal at Action Stations. He then called for the Captain of the Guns crew to fire the device. Bob FRITH later 562A was the trained man. The depth charge type bombs needed to set at different depths all around the Frigate, which was restricted to 2 knots. It was fired successfully and sunk the U Boat with all hands. The Frigate was also damaged to its underside due to the force of the explosion and the lack of depth. However, it made for Glasgow where it was repaired. The device which threw a pattern of Depth Charges all around and close to the firing vessel was discontinued in that form due, to collateral damage to the firing vessels. Robert FRITH and the Asdic Operator were both awarded the D.S.M. The Lt. Comdr. SCOTT the D.S.O.The Nyasaland was afterwards handed over to the free French Navy with over twice the complement of The R.N.crew, accompanied by variuos farm animals i.e. chickens. Bob was part of the R.N. crew who assisted in the running of the ship along with the French Navy who were a tough lot of blokes.Afterwards he joined the superb new destroyer HMS 'Zenith' which was eventually sold to the Egyptians and was scuttled as a blockade ship in the Suez Canal crisis. Robert also served on numerous Russian Convoys to Murmansk and Archangel, as a Leading Seaman Gunnery. Known as Captain of the Guns Crew. 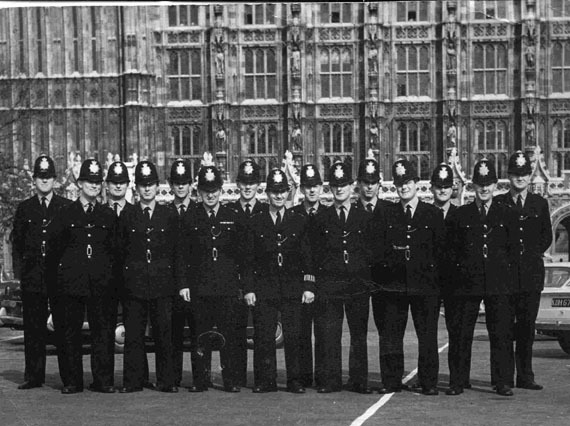 Later he joined the Metropolitan Police in Royal A Division and served as plain clothes officer at the Palace of Westminster the Houses of Parliament. Retiring after 28 years service plus two years allowed from his six years at war . He currently resides at Yapton, Near Arundel, with Valerie his wife, the daughter of Dr Russell CARGILL the donor of and founder of the Cargill Cup and Middlesex Sevens. 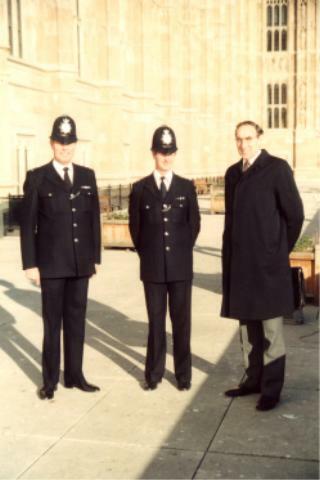 MORE PHOTOGRAPHS IN 'PALACE of WESTMINSTER PHOTO GALLERY'. Click on above picture to be taken to 'PALACE of WESTMINSTER PHOTO GALLERY'.